Are you looking to create extra working space within your business premises by the addition of modular buildings and are you looking for a top quality supplier? If so, don't hesitate to contact the professional team at Modular Direct who have been providing modular buildings for over 30 years. 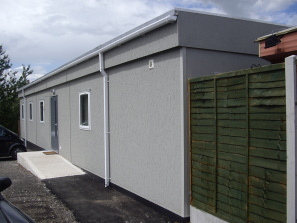 Modular buildings are the perfect answer where additional space is required in a limited timescale without the need to go down the route of a traditional build extension (which can take many months to complete). They offer versatility both in terms of the external finish, height and capacity. A modular building can be erected on your site within a matter of days as the vast majority of the work to create and build your modular building is done within the Modular Direct factory. This causes minimal disruption to your premises and work force. In addition to this, modular buildings are very cost effective with a keen eye on the economics of budgetary constraints. Modular Direct supply modular buildings to a very wide range of clients and industry sectors including educational establishments, offices, factories and other commercial premises and leisure facilities. They have an enviable reputation for using only the very finest products in the manufacture of their modular buildings to ensure that durability and longevity are achieved. Customer and after sales service standards are excellent. To enquire about a modular building for your business premises please contact Modular Direct on: 01482 881700, email: [email protected] or complete the 'contact us' form.